The praying mantis is an unusual, exotic insect. These insects can be found throughout the world. Tiny and green in appearance, these insects received their name because of how they look. When their forearms are folded together, they look as if they are praying. They have an unusual sense of elegance and almost hypnotize with their appearance. While some people simply think of the praying mantis as an insect, it also happens to be an amazingly spiritual creature. As a spirit animal, this insect is a symbol of peace, truth and calmness. When this praying insect appears in your life, it brings a sense of happiness and calm. While you might see this insect all the time, you may be unaware of its power. This type of insect is said to never make a mistake. It thinks each move through carefully before it does anything. It is also said to be a symbol of good luck. When you see a praying mantis as your spirit animal or animal totem, it rings peace and truth into your life. When you have the praying mantis as your animal totem, it can become a source of peace and silence. It is the animal to turn to when you want to live a quiet life and carefully think through all of your future movements. 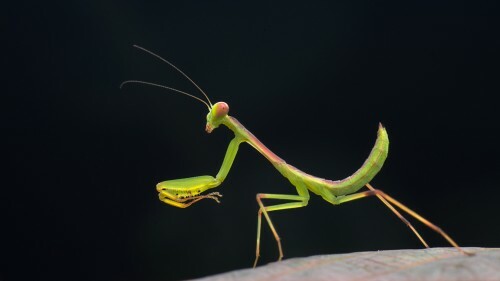 The praying mantis will think about its next movements over hours and hours before it ever makes the next decision. The most important thing for this totem is inner peace. Praying mantis people always work to think through everything in life before they take a step. They have to carefully plan out each movement so that they do not make any mistakes. These types of people are able to be patient and wait for the right movement. They rarely make mistakes because they are patient and plan each step out carefully. Some people believe that the praying mantis can speak to the unknown. They are able to connect to the divine and the otherworld to receive messages and intuitive guidance. When you need a moment of calm and a peaceful outlook, you should reach out to the praying mantis. This divine insect can help you discover your own spiritual truth. Even when life is unbearably busy, you should move slowly like the praying mantis so that you can make smart choices and avoid any potential pitfalls. If you are lucky enough to have the praying mantis cross your path, make sure to pay attention to it. The praying mantis is reminding you to take a moment to yourself. You need to spend time in meditation as you think things over and plan out your next step. Do not let anyone pressure you to take action before you are ready. It is only by being patient and thoughtful like the praying mantis that you can take action in life without making a mistake. Seeing a praying mantis is typically considered a sign of peace and mindfulness. Like the mantis, you must meditate and pray on your life before deciding on the next action. In China, this insect was traditionally considered a symbol of mindful movements. The praying mantis represents awareness, patience and creativity. It is said to be a symbol of intuition. When you need extra peace and patience in your life, you should turn to this animal totem. The praying mantis is said to have a number of common meanings associated with it. We will cover some of the most common meanings behind this insect. Stillness: The praying mantis is known for being extremely still and peaceful. It spends a great deal of its time relaxing in stillness and planning out how it will achieve its next meal. Like the praying mantis, sometimes people also need to spend more time in stillness and plan out the next course of action. When the praying mantis is your spirit animal, it is inspires you to meditate and think through your lie. Spend some time in meditation as you work to figure out your potential and path in life. Intention: The praying mantis never stops praying on what to do. It has an intent in mind at all times. For the praying mantis, this normally involves searching out prey. For humans, it is a reminder that you have to focus your mind on something. For you achieve great things in life, you must have clear goals and a set intention. Without an idea about where you are going, you will never forget how to get there. Peace: A praying mantis is an insect of peace. It lives harmoniously with the world around it as it listens to the silence. The praying mantis can teach you the power of meditation, peace and harmony when it is your spirit animal. Satisfaction: All of those intentions and silence are spent with a goal in mind. Because of this, the praying mantis is good at reaching fulfillment and satisfaction. It feels immense satisfaction when it catches its prey, and then immediately begins thinking of how to improve its hunting game for the next hunt. When you have the praying mantis as your spirit animal, it teaches you how to be satisfied with success and how to immediately plan on how to put your experience and new abilities into action. 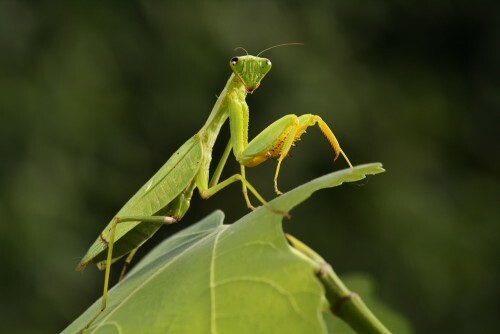 Mindfulness: Mindfulness is a useful skill that we can learn from the praying mantis. It is mindful of each decision. 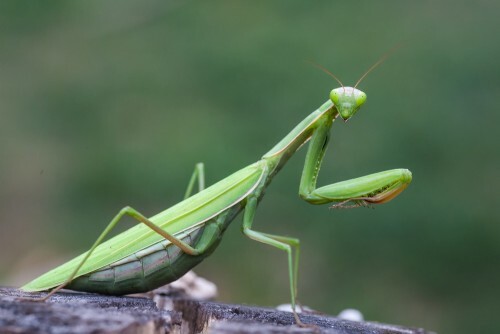 As your spirit animal, the praying mantis is intended to guide you toward the right choices and decisions in your life. Intelligence: A praying mantis might be an insect, but it is immensely intelligent. It has a unique talent for hunting other insects and is extremely patient. It is calm and never shows fear around other insects. What Does It Mean When You Dream About a Praying Mantis? If you have a dream about a praying mantis, it can mean a number of different things. Sometimes, these dreams happen because someone is ignoring you in your life. They can also happen as a warning about an approaching danger. The praying mantis may be trying to warn you to be careful and watchful like the praying mantis is to avoid these potential dangers. It may also be warning you to watch out for people who may be trying to deceive or trick you. If you dream that the praying mantis is attacking a larger prey, then the dream is trying to tell you to face your fears. When the praying mantis attacks you in the dream, it means that you need to stop being so busy and take some time out of life for yourself. Meanwhile, a dream about a praying mantis hunting its prey is a reminder that you should take your time and wait for the right opportunity as you make your next move.